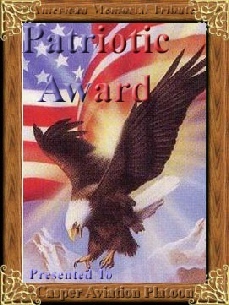 I am proud to present you with the Seal Of Patriotism Award. Your site "Casper Aviation Platoon" is wonderful and most certainly deserves to carry my award. Everything about your site is wonderful! Not only is your site easy to navigate it is also full of valuable information! As the wife of a Vietnam Vet and the mother of a soldier serving in Iraq, I salute you for all that you and your website stand for! For its Veteran Appreciation to all military on the Web. Your website was judged on it's content, functionality, graphics and usefulness to the general public. We spend a lot of time reviewing sites and not all make the grade. You have done a great job, keep up the good work! Ned, The World Wide Web Awards are designed to supply formal recognition to webmasters & designers who have shown outstanding achievement in web design content and creativity. Congratulations! Your site at: CasperPlatoon.com has been selected to receive the "Gold" Award from The World Wide Web Awards. Great Site, with nice graphics, layout, design, navigation and appearance. We enjoyed your site and learning about your platoon during the Vietnam War Your site is a wonderful contribution to the Internet community. As a door gunner on the Huey and the UH-34 at Marble Mountain, Dong Ha in 1966-67, I am delighted to offer you my White Dog Award. We feel you have a beautiful site! There can never be enough thanks for our Veterans. To you Ned, I say, "thank you for your service to our country and welcome home." I say, "Hoooorah!" Congratulations! We really enjoyed looking at your website! You have a lot of military history, stories and photos of your unit during the Vietnam War. Your patriotic tribute that is dedicated to all American veterans and 911 victims is also very well done. It would be an honor for us to present CasperPlatoon.com with our Patriotic Award. Congratulations! Ned, I am please to present your website with my Crew Member Aviation Award for an Outstanding Website. I really enjoyed my visit.